On Tuesday, June 6, the Chuck Jones Gallery in San Diego hosted a reception for the publication and release of "Presence: An Invitation to Be Your Creative and Authentic Self". This anthology along with related stop-motion animated films were the product of a collaboration between the nonprofit Words Alive! 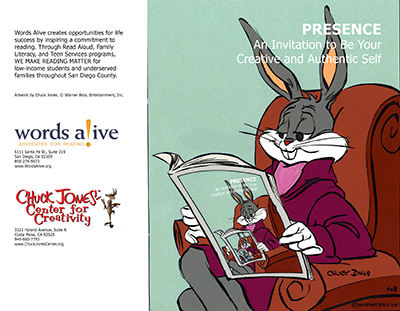 of San Diego County and the Chuck Jones Center for Creativity. Each year, Words Alive! works with "at hope" youth, youth who have been or are incarcerated, in foster care, or out on parole, helping them achieve and succeed in school. For 18 years, Words Alive has been an ardent leader in the movement to make reading matter for families, children and teens in San Diego County, giving them the necessary tools for success and the ability to transform their lives. A key component to making this happen relies on our partnerships and collaborations with the community. Our longest-standing partner in this effort has been with Momentum Learning (Juvenile Court and Community Schools) through our Adolescent Book Group and writing program. Designed to reinforce the act and practice of reading and writing within a population of teens who face extraordinary circumstances, trained facilitators spend many hours each month delivering a specially-designed curriculum to over 350 students, reigniting their interest in reading. The collection here — letters the students penned themselves to accompany the animated short films they created around the theme of “presence,” represents many months’ work with Words Alive writing instructors alongside our partners at the Chuck Jones Center for Creativity. Always identifying deeper and more meaningful ways to connect to text and to support the students’ storytelling ability, the Chuck Jones Center for Creativity and Words Alive developed this opportunity for students to explore creative and transformative avenues of expression and understanding. It was an awesome partnership! To view a selection of the student films on YouTube, click here. To purchase the anthology, "Presence: an Invitation to Be Your Creative and Authentic Self", click here. The anthology is the most hopeful book you'll read this year, it's highly recommended! "I am mad and frustrated, I wonder if I have to do this, I hear my teacher nagging, I see a blank paper, I want to do something, I am mad and frustrated. "I pretend to do my poem, I feel my paper, I touch my pencil, I worry I'll fail this assignment, I am mad and frustrated. Tagged: Chuck Jones Center for Creativity, Creative and Authentic Self, Presence, Words Alive!